This manuscript contains a compilation of fragments of books for royal coronations, ordinations of priests and monks, and other ceremonies which must be conducted by an archbishop or a bishop. Most of the material in it comes from the late Anglo-Saxon period, some of it is later, mostly of the 12th century, and parts are from the Continent. Robert Cotton, who owned it in the 17th century, bound the fragmentary books together in to one, within a cover bearing his coat of arms. A picture which was originally intended to represent Pope Gregory the Great (identifiable by the dove whispering divine inspiration in his ear) has been since the middle ages at the beginning of part of a pontifical (directions for sacraments performed by a bishop) made in the 11th century at Christ Church, Canterbury, possibly under Archbishop Eadsige (1038-50). The picture, however, was made on the Continent, probably in northern France or the Low Countries, about 1000. In the 13th century, someone at Canterbury wrote at the top 'Dunstan archbishop,' newly identifying the figure as the great 10th-century archbishop. The same person added the black-robed monk to the archbishop and monk in white below. 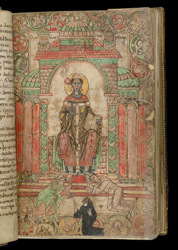 This is an example of the interchanges of books and art between English and Continental ecclesiastics during the 11th century and also of the importance of Anglo-Saxon saints in the following centuries.